To view a recording of our October 5th Webinar, the 5-step process for removing the 12 decision making biases that affect every organization, click here. Natural biases negatively impact decision making on a regular basis. Organizations struggle with how to identify, understand and avoid these biases to make sure that they are making good decisions that support the company strategy and make most effective use of the various forms of corporate capital (human, machine and financial). The first task in this process is to understand the various types of decision biases. Anchoring is a decision bias that results from relying on incorrect assumptions. This happens when people do not properly research assumptions or when assumptions were based on older and now irrelevant information. Status Quo is a decision bias that skews towards alternatives that support the status quo. Organizations often are reluctant to change and avoid risk. Therefore, they are biased towards projects that do not wander from the status quo. 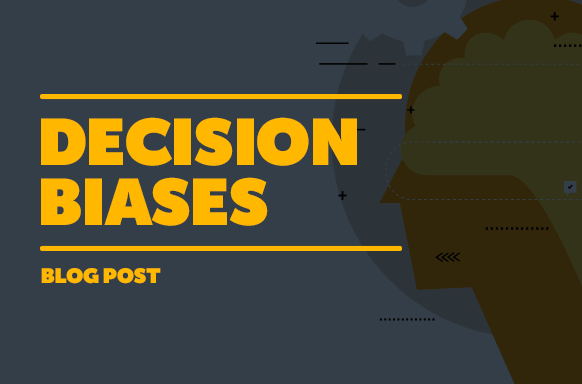 Sunk Cost is a decision bias that involves making choices that justify past decisions even when past decisions do not seem valid. This is often called throwing good money after bad. In this case people are justifying what has been done in the past. Confirming Evidence is the tendency to decide what to do before deciding why. This often is a gut feel approach where the decision maker knows what they want to do and makes assumptions to support that plan. Framing is a decision bias that profoundly influences the choices based on the way that the problem is framed. Sometimes people can describe a problem with a solution in mind and then the decision is made not simply by fact but in the way the problem was described. This causes a bias towards certain alternatives. Estimating/Forecasting happens when estimates and forecasts are made without clear feedback about accuracy. Priming involves being influenced by information received right before making decisions. Often decisions can be influenced by the timing of the facts that are made evident right before the decision. In this case, the new fact takes precedence over the body of evidence around a problem. Project Influence happens when teams select a project that seems desirable to them. People naturally have preferred approaches and projects. It may appeal to them intellectually or in some other way. They will select an alternative that is more comfortable or acceptable to them rather than the right alternative. Politics is a decision bias that skews to the most influential person in the room. Often the senior person in the process will direct the decision towards their preferred solution. Personal Influence is a decision bias where individuals make decisions based on personal bias for or against the project owner. People can make decisions based on their like or dislike for a particular person. If that person has recommended or is promoting an alternative, the decision can be influenced by the personal relationship with that person. Dominant Criteria is a decision bias that involves using one criteria to make a decision and ignoring the others. Often this involves only accepting data that supports a pre-determined approach. You can see this in government all the time. When a certain issue surfaces and one party will be completely influenced by one set of facts and the other will focus on another set of facts, but the entirety is not considered. Thin Slicing is a decision bias where individuals make snap judgements based on first impressions. This often occurs when people are in a rush to make a decision. They will not carefully consider all the facts but make a decision quickly based on surface information without considering consequences. Think of how you may have witnessed or even applied biases to your decisions in the past. It is not difficult to see ourselves and our organizations in the above list. These biases can apply to any decision that requires prioritization, like capital allocation (human, resource, mechanical, financial) and decision making. These decisions can involve many different people or functions within an organization from general management, finance, sales, marketing, human resources, client support, field operations and so forth. After you have understood these and how they may have influenced prior decisions, it is next important to determine what you are going to do about them. We have developed a five-step process to better decision making. Strategize – In this step, the strategic team defines the strategic priorities of the organization and breaks them down to strategic objectives that can be measured. Compare – The strategic team then uses pairwise comparisons (a scientific comparison method known as the Analytic Hierarchy Process) to compare strategic priorities and objectives and obtain relative weights among them. The result is a strategic value scorecard that is well balanced and reflects what’s important to the organization. Quantify – This step consists of developing scales to measure and quantify each of the strategic objectives. These scales can help the user quantify all of their priorities even if they are subjective. It also allows the unique preferences of decision makers to be captured and used to evaluate a large number of alternatives. Score – All projects are scored against the strategic value scorecard as well as complexity and urgency. The result is a project and portfolio scorecard that identifies how each project will impact the strategic priorities of the organization. This ensures perfect strategic alignment and that resources are spent on the most strategic projects. Select – This step consists of presenting the project scores in an intuitive format that makes it easy for the decision makers to select projects. The result is a capital allocation process that leads to the selection of a portfolio with as minimum variance as possible from the strategic priorities profile. This process can improve decision making and significantly reduce or eliminate common biases in the decision-making process. It adds assurance to the decision and eliminates analysis paralysis and doubt. It also shortens the decision-making time frame and improves the ability to achieve true strategic objectives. Now that we understand the process, the next key is how to implement this. Fortunately, there is a software solution that will help your organization make better, more quantifiable decisions. This software has been utilized for decades and is now commercially available to large and small organizations alike. The good news is that while it is powerful and can help organizations immediately, it does not take an advanced degree to understand and use. Training can be accomplished for any person with a college degree and a basic understanding of quantitative analysis (basic mathematics). To learn more about decision biases, a structured and quantifiable decision making process and the software solution that improves your process, visit our biases page.